I've been to Bangkok twice already, and one thing I really love is Bangkok shopping. The city has a variety of shopping options for any traveller that ranges from budget to splurge! If you're a budget shopper, one of the markets that you must go to in Bangkok is Chatuchak. Chatuchak is a market that opens only on weekends. According to Wikipedia, Chatuchak is the largest market in Bangkok and of the world! It has more than 20,000 stalls that sells everything you need from furniture, clothing, houseware, Thai handicrafts, food, pets and a lot more. 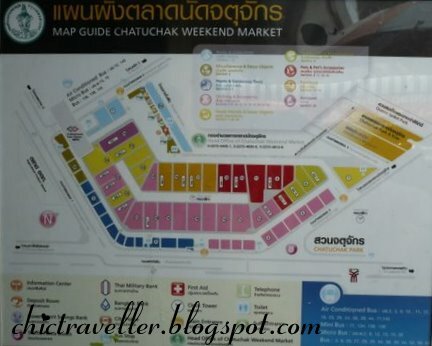 With Chatuchak's very big area, one would actually need a map to identify key areas to go to. The total area is actually divided into several categories for easy reference, but you'll find out that the area is not entirely exclusive to that category shown in the map. Chatuchak Market is exceedingly big! I've been there twice and I think I've only covered barely 1/8 of the total area. It's impossible to cover the entire Chatuchak market in one day. When you go there, you need to have an end in mind. You should ask yourself: "What do I want to bring home?" Chatuchak is certainly not the place to go window shopping or browsing. When in Chatuchak, you should seriously prioritize your shopping needs. Visit first the area of the market for the goods you need to buy. When you see something you like, buy it. Chances are, you won't be able to go back to that store again. Chatuchak is like a big maze, and it's definitely the place to go all out impulsive on shopping. Despite its chaotic nature, you'll learn to love Chatuchak for the unique experience that it offers. For one, Chatuchak is a place to hunt for hard bargains. Bargaining in this market is a way of life. Remember to first haggle the item that you want for half the price and start negotiating from there. When you have friends with you, buy together in one store to get wholesale prices. After a day at Chatuchak, you'll surely go home tired but hopefully happy with the goods you've brought home. 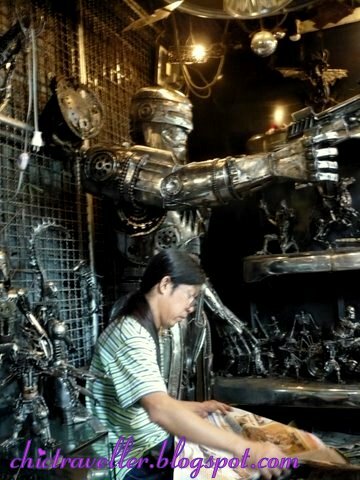 I'm not really a fan of the Chatuchak market, but I'm glad I got to visit it for its unique shopping experience. You'll really get to find everything in Chatuchak, especially if you have the patience to go around the market. Who knows? You might even find that life-sized Robocop replica you've always been looking for. Of course, there's the reliable taxi but you could also take the sky train (BTS) to Mo Chit station. From Mo Chit, you'll see a big park and exit to that side. You need to walk a bit to get to Chatuchak Market. Another way is to take the subway (MRT) to Suan Chatuchak (Chatuchak Park) station. Chatuchak is open from 8:00am to 6:00pm. It's best to get there early to avoid the huge crowd and midday heat. i see a nice looking vintage shirt! I want to go. Sure sounds amazing! "When you have friends with you, buy together in one store to get wholesale prices. ">>> my mom uses this technic. LOL. shopping is indeed a way of life for women. the robocop statue is cool! @globetrottingbride: you should go when you're in bangkok :) it's really a different shopping experience. @the dong: yup i read about that store in a travel site. i think it was on wikitravel. swerte nga namin, we chanced upon it over 20,000 stalls!